The two Tsalala Pride Females are completely in control of things at the moment! 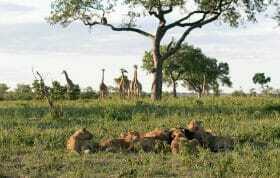 In the last 4 days they seem to have set up camp at Nanga Pan; using it as a base to stash away their thriving 4 cubs whilst picking off poor unsuspecting Impala who wander down for a drink. Yesterday we managed to track them down on yet another Impala kill. 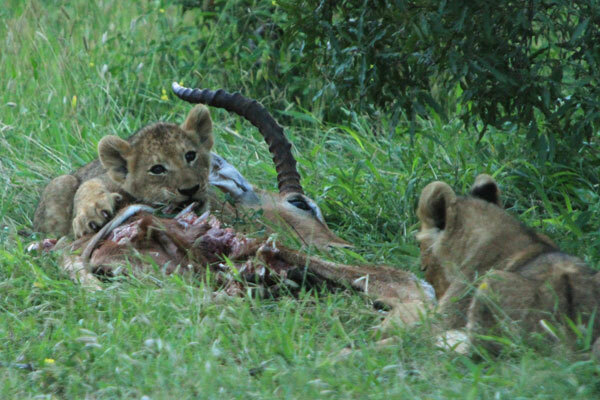 In the process we stumbled upon 2 more similar kills within 200 m of where the family was happily playing and feeding. It was sensational to watch these 4 youngsters having an absolute blast running about, jumping on each other, tackling the already dead impala and trying to come to terms with their recent growth spurt. 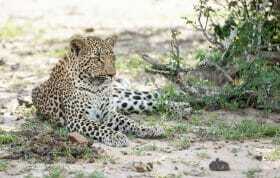 On an even better note the cub with a limp is still surviving and keeping up with the rest of the pride. The remaining 5 members of the Tsalala Pride were also observed this week in Marthly and were looking in fine shape. When do you think these 2 groupings will rejoin? Hi Penny, the cubs were seen this morning and its appears that although the limp is still present, this young cub is coping well enough to move with the pride. We will continue to keep you updated on his progress as well as all the cubs growth.